5 ways the Klang Valley MRT project will impact the property market in Kuala Lumpur and Greater KL. Home > News & Articles > Property News > 5 ways the Klang Valley MRT project will impact the property market in Kuala Lumpur and Greater KL. Posted on November 30, 2016 | 7196 views | Topic : Property News, Quick Reads. Connectivity and Transit Oriented Developments (TODs) will be the trend in the property market from Sungei Buloh all the way to Kajang. We list down five ways the upcoming Klang Valley MRT (KVMRT) project will impact the property market here. Take a walk along Jalan Bukit Bintang and near The Curve and you cannot help but notice the major construction work going on in building Malaysia’s first MRT line. I recall first hearing about the MRT project back in 2008 when I had accompanied an architect friend to survey, take measurements and pictures of various sites across Kuala Lumpur. Back then, the MRT project was still very much in the development stage and not many people knew of it. I was lucky that I had privy to the information as the firm that my friend was working for had been tasked to undertake the proposed design for the various stations. Fast forward almost eight years later, RM900 million has been allocated to reduce traffic congestion under Budget 2016 and the Klang Valley MRT project is making great progress with testing works being done at various stations. With the trend towards connectivity and Transit Oriented Development (TODs), we list down five ways the KVMRT project will impact the property market here. DBKL has set the goal of 60:40 for public transport ratio versus cars. It currently stands at 30:70 for public transport ratio versus cars. Penetration rate has increased significantly from the approximately 20 per cent since 2008 due to improvements work made by Prasarana. With the MRT project, penetration rate is set to rise, provided fares are kept reasonable. With the trend towards transit oriented development (TOD), a few of the MRT stations will be integrated with their existing surrounding buildings as well as new and upcoming projects. According to DBKL, TODs must be between 200 and 400 metres from the MRT or LRT or other train stations. In addition, it must have seamless connection from the train station to the building similar to the Singapore model. Some of the TODs that are set to rise near MRT stations include planned developments at Kwasa Damansara and Kwasa Sentral as well as the iconic Bandar Malaysia project located at Bandar Malaysia North and Bandar Malaysia South, just to name a few. According to our research, properties that are located close to the MRT lines can command a 5 to 10 per cent premium in asking price in both the resale and rental market. This is welcoming in light of the huge supply of homes in the Klang Valley area where both markets have seen softening activities. In light of this, prospective house hunters may want to look at homes that are located within 1km radius to the upcoming MRT stations. How do you ensure your home enjoys capital appreciation? Easy, buy the most affordable properties but with the greatest room for capital appreciation. As such, Southern Kuala Lumpur is the new growth area as land costs here are still relatively cheap with translates to cheaper development costs. In addition, there are three iconic projects that are being planned by the government that will enhance the desirability of the area – Malaysia Vision Valley, Cyber City Centre in Cyberjaya and KLIA Aeropolis. There will be new infrastructure development to support growth in the southern corridor. 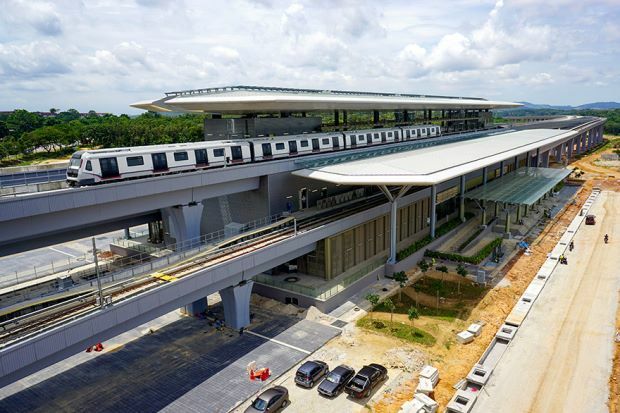 They include the KVMRT station in Kajang, the Sungei Buloh-Serdang- Putrajaya MRT Line 2 and two High Speed Rail stations serving Putrajaya and Seremban. When buying a property, one should always follow where budget has been allocated to build new infrastructure so that your property will enjoy a spillover from the train stations once they are completed. If you had missed the boat for KVMRT Line 1, it is still not too late as there are still the Line 2 and HSR infrastructure projects for you to start your property hunt. Aside from being a regular columnist for Propwall.my, Khalil Adis conducts workshops and property courses for first-time homebuyers in Malaysia and is a highly sought-after speaker in Malaysia and Singapore. He is also author of two best-selling books – “Get It Right Iskandar” and “Property Buying for Gen Y”.